We are specialists for international transactions of pre-owned yachts and able to help you in selling or buying your yacht as well as finding a berth. 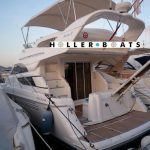 Being based for nearly 20 years at the Eastern Spanish Mediterranean Sea coast we will advice about the best boatyards and specialists in the region. Our founder is a German lawyer who will guide you through the legal aspects of buying/selling a yacht. Our BMSE (British Marine Surveyors Europe) surveyors operate in Spain and the rest of Southern Europe. Our presence of nearly 20 years at the Eastern Spanish Mediterranean Sea coast will help you to find or sell a berth. We carefully choose our charter skippers and sail/motor yachts in order to give you a fantastic maritime experience. - Experienced yacht surveyors operating in Southern Europe. Our aim is to find the best yacht for our clients providing a truly personalised service.